Today I broke the 1st commandment of speeding – never speed at the end of the month. Today on my way to Corning I got slapped with my 1st ever speeding ticket for going 87mph in a 65mph zone. I was definitely speeding, although I’m pretty sure I was going 80-85mph. I will unfortunately plead guilty and pay whatever large fine I get dished out, but not without first looking for loopholes and cooking up a conspiracy theory. The cop already knew from running my license plates that I was driving a rental car from out of state. This means it’s a pretty safe bet that I won’t return to New York to contest the ticket. So if he exaggerates my speed (20mph over), I get a much more expensive ticket which I am likely to pay. I didn’t want to question him and get myself in more trouble. Anyway, since I have an IL license hopefully the ticket won’t find it’s way onto my permanent record. 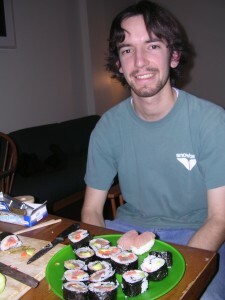 Tonight Suelin, Mat, and I attempted to make our own sushi, and it actually came out great!